Who was the first NASCAR race car driver to ever win in a Pontiac? If you answered Everett "Cotton" Owens [or read the subtitle for this story], you're absolutely right. Known as "King of the Modifieds," Cotton Owens is a household name for fans of Pontiacs from the fabulous days of the Daytona Beach and Road Course and the early years of the NASCAR Super Speedways. Cotton began his professional racing career in 1950 when he competed in the first Darlington race driving a '50 Plymouth owned by F.J. Bland and mechanic Joe Rumph. Cotton was leading the race when the right rear tire blew, after which he had many tire problems, causing him to finish seventh. According to Cotton's biography, he finished Thirteenth in the points standings and earned $1,100. His first trip to Victory Lane brought Pontiac along for the ride. 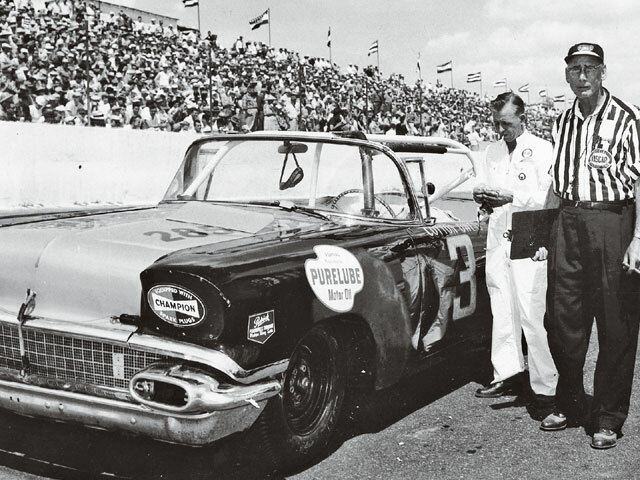 In 1957, at the Daytona Beach and Road Course, Cotton took home $4,250 and earned prominence as the very first race car driver to earn Pontiac a NASCAR win. Cotton Owens takes a moment from racing his '58 Pontiac Chieftain at Darlington as NASCAR inspector William (Bill) Taylor looks on. He was recruited to race Pontiacs by Semon E. "Bunkie" Knudsen, the General Manager of Pontiac Motor Division, and Ray Nichels, Bunkie's righthand man in Pontiac's stock car development. 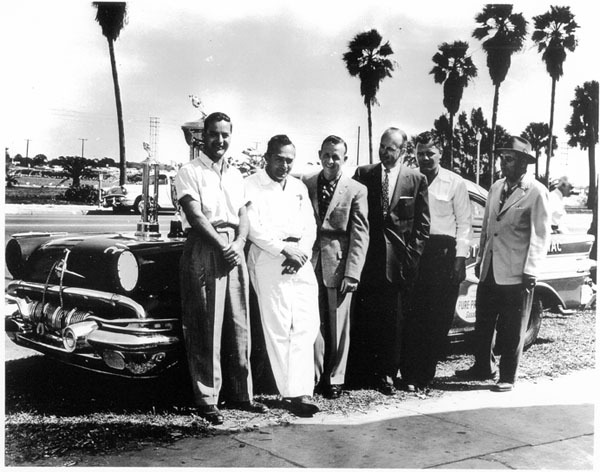 Bunkie personally agreed to put Cotton behind the wheel of a Nichels Engineering-prepared '57 Pontiac Chieftain at the 4.17 mile Daytona Beach and Road Course on February 17, 1957, after recognizing Cotton's talents the year before in a Lou Moore-prepared '56 Pontiac sent to Daytona by Bunkie himself. Bunkie's plan to rapidly shift Pontiac's image from a family-friendly car into a champion race car had called upon its first candidate. If his desire was to have Cotton initiate it with a much-needed national win, then he was successful. According to NASCAR records, Cotton piloted all 39 laps of the historic 1957 Daytona Beach and Road Course race, tracking 159.9 miles over 1 hour, 34 minutes, and 29 seconds, at an average speed of 101.541 mph, and winning first place with a commanding 55-second margin of victory over Johnny Beauchamp. Pontiac was quick to pump up the publicity. An advertising campaign that featured Cotton was released to the national press and enthusiast magazines. It showed Cotton being awarded the Harley Earl trophy, which was presented personally by Harley as Bunkie, NASCAR President Bill France, and Ray looked on. 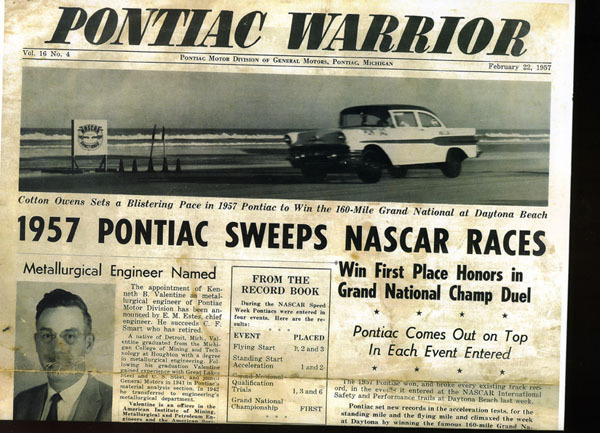 The advertisement proclaimed, "NASCAR's Top Award Goes to Pontiac, Undisputed Grand National Champ over all Stock Cars, regardless of Size-Power-Price." The No. 6 Catalina is shown in action at the 1960 Daytona 500 with Cotton Owens behind the wheel. Cotton had the pole with a pole speed of 149.982 mph. Cotton Owens was more than a top-rank NASCAR driver. He was a highly-respected mechanic, too. Here, during the USAC Inspection process, part of the Nichels Engineering 24 Hour Speed and Endurance Runs at Indianapolis Motor Speedway, Owens digs into one of the two '62 Catalinas supplied by Pontiac for the event. Impressed with Pontiac's new '57 Chieftain race car, Cotton continued campaigning the stocker in 16 of the 17 races he ran in 1957, earning $12,325. On September 17, 1957, at the Southern 500 in Darlington, South Carolina, Cotton earned his second biggest cash prize of the year, $6,100, for a courageous top-tier finish, putting him behind only Speedy Thompson on the leaderboard. He continued to race Pontiacs in 1958, moving up to the '58 model. Cotton took first place at the Monroe County Fairgrounds in a 100-mile NASCAR-sanctioned Grand National race and was national runner up in the NASCAR Championship for the 1958 season. More successes were soon to come. In 1959, Cotton, driving a '58 Pontiac, took the quickest time away from Fireball Roberts, with a speed of 143.198 mph, at the inaugural Speed Week of the Daytona 500. In 1960, driving a '60 Pontiac Catalina, Cotton took the pole at the Daytona 500 qualifier on February 12, and again at the Daytona 500 on February 14, with a pole speed of 149.892. He continued to campaign a Pontiac Catalina in 13 of the 14 races he entered in the 1960 season, earning $14,065. By 1961, Cotton was racing '61 Pontiac Catalinas exclusively, and it paid off with four First Place wins: Spartanburg, Hillsboro, Columbia and South Boston. He took home $11,800 in earnings. Cotton's final full year of racing was with Pontiac and its '62 Catalinas. Due to eyesight problems that forced him to withdraw from the driver position, he then focused his incredible talents on leading his own race team to some of the most famous moments in NASCAR history. Cotton Owens was a key member of the Nichels Engineering Team, and endurance-tested '62 Pontiacs at Darlington and Indianapolis with the biggest names in NASCAR. Here at Darlington, the six standing drivers are Joe Weatherly, Len Sutton, Rodger Ward, Glenn "Fireball" Roberts, Marvin Panch and Paul Goldsmith. 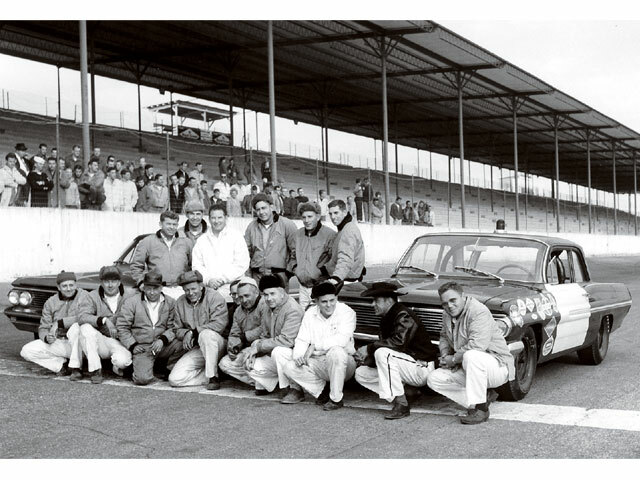 Kneeling are Manfred Hodge, Ralph Knopf, Cotton Owens, Bud Moore, unidentified, Ray Nichels, Chuck Blanchard, Jack Smith, Smokey Yunick and Banjo Matthews. Today, the famous racer still owns and operates Cotton Owens Enterprises in Spartanburg, South Carolina, the very same pleasant town where he enjoyed building, preparing, and racing Pontiac stock cars in the 1950s and early 1960s. High Performance Pontiac magazine recently met the gracious Mr. Owens at a private event at the J.B. Day Riverbend Stock Car Museum in Easley, South Carolina. We asked if we could give our readers an exclusive interview with him, the world-renowned racing legend. He agreed and said, "I'm happy to talk about my race days with Pontiac. Let's do an interview." High Performance Pontiac: What was the first Pontiac you professionally raced? Cotton Owens: The first one that I drove actually in the Grand National races was in 1956 in Daytona Beach, Florida [on February 26, 1956]. That Pontiac was a '56 two-door Chieftain sedan. It had the V-8 317 ci engine. HPP: What prompted you to get behind the wheel of a stock car, especially a Pontiac? You were best known as "King of the Modifieds" in the Grand National Featherlite series. 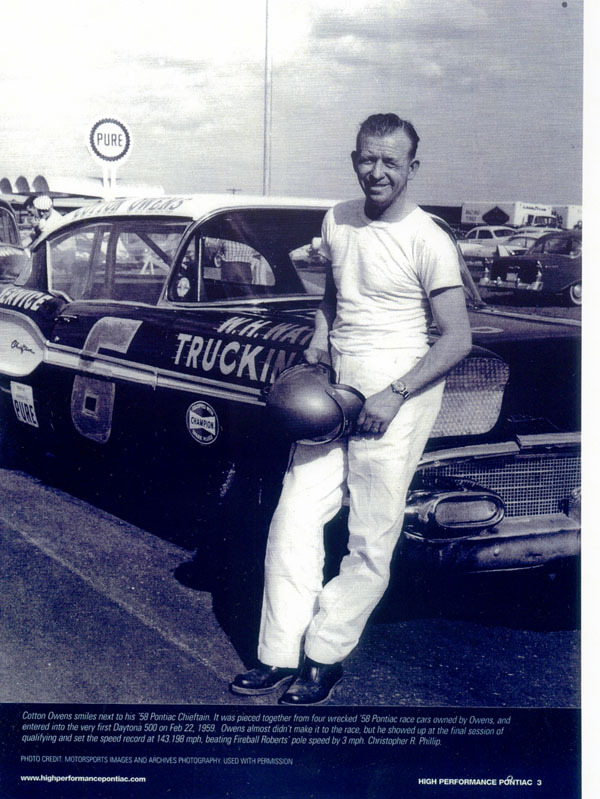 CO: As well as I can remember, Lou Moore, who was an Indianapolis mechanic, had brought two cars to Daytona for Bunkie Knudsen, and they called me and wanted to know if I wanted to drive one of them, because I was a part-time Grand National driver. I mainly ran modifieds all the time. So I told them, "Sure, I would be more than glad to." I liked to drive and was a part-time driver of any type of race car. They understood that I knew the Daytona Beach and Road Course from previous races that I had won there in 1953 and 1954 in the modifieds. HPP: Did you drive the Lou Moore-prepared Pontiac again in 1957? CO: No. I only drove the Lou Moore Pontiac car in 1956. Lou died, and Ray Nichels took over the Pontiac deal and brought two new cars to Daytona, along with me and Banjo Matthews. Banjo sat on the pole and I sat third, but I won the race and set the new race average speed record at 101.541. That was in 1957 in a '57 two-door post Pontiac Chieftain coupe. HPP: Why did you like Pontiacs in 1957? CO: I liked them because they were fast, and it was really the car to beat back then. When [Pontiac] came [to Daytona] in 1956, no one had heard of a Pontiac race car, yet when I went to Daytona, I ran second to Tim Flock. We lost a fan belt, which put us out of the race. Pontiac was real fast, but Tim was the fastest in that race. The '57 Pontiac was the fastest car. It took all top honors at the beach. HPP: What was mechanically special about the '57 Pontiac that Bunkie delivered to you to drive at Daytona? CO: It had three 2-barrel carburetors-they called them Tri-Power carburetors-and we had dual exhausts. The displacement was higher than was advertised. This was Pontiac's high-performance motor. We had a three-speed manual trans and we were allowed to change the shocks and springs, which made the car really stable at high speeds. The shocks and springs made the car run like a champ. HPP: How did it feel to give Pontiac its very first win in NASCAR? CO: It was great winning with that many cars on the beach. We led the first lap and the last lap. Meeting Harley Earl and Bunkie Knudsen was a real honor. They loved high-performance cars also and, because this was Pontiac's first win, it made it extra special. Joe Weatherly, Cotton Owens, and Glenn "Fireball" Roberts smile in 1961 during the work for Ray Nichels Engineering and his endurance testing of the '62 Pontiac. HPP: Was Pontiac a good sponsor for you? 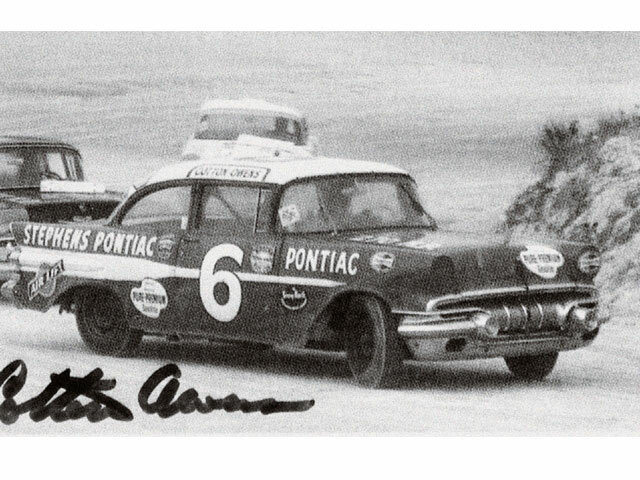 CO: When Pontiac hired me to drive their car in Daytona in 1957, we were going to run some more races with them, but due to the 1958 Automobile Manufacturer's Association (AMA) racing ban, GM pulled out of competition at that time. A little later on, I bought that '57 Pontiac [that won the beach], and from then on, it was my whole deal. HPP: After Pontiac pulled out of factory-sponsored racing on June 6, 1957, did they supply you with performance parts for your stock cars? CO: Back then, you didn't have access to any parts. You had to make whatever you ran-like front hubs, rear hubs and that type of stuff. We actually had machine shops that did all that for us. So, really, it was very competitive [to find the best machine shops]. HPP: With Pontiac no longer your sponsor, how did you get '58 Pontiac models to build and race? CO: I bought them from a dealer who took in wrecked automobiles on trade.HPP: What made your 1958 season with Pontiac special? 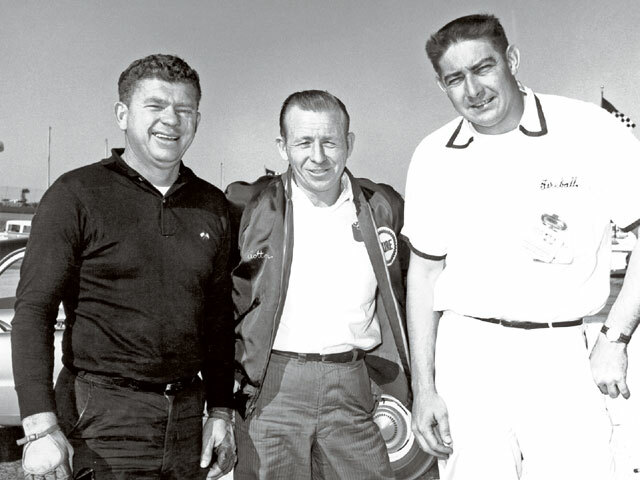 CO: Running for the 1958 NASCAR National Championship was special for me because, though I had a few friends who worked as my pit crew, I had only one man who worked for me regularly, and the two of us did everything. My pit crew was made up of friends who worked other jobs during the week and helped me out on the weekends. This was the only year I ran for the Championship, so with limited funds and help, it was quite an accomplishment to be the runner up. HPP: How did you feel about the performance changes in the Pontiac motor from the 347 and 370 ci offered in '57 and '58 to the 389 ci offered first in '59. Did it help you in NASCAR? CO: That was a great improvement, although the '57 engine had plenty of horsepower. In other words, we outran everybody that was racing at that particular time. I never did have a '59 Pontiac. In the 1959 season, I raced with a '58 Pontiac. My first new [389 ci] car was a '60 Pontiac. HPP: At that time, was Hedge's Pontiac your sponsoring dealer? CO: Yes sir, they sure were. The factories at that particular time weren't in racing, so we had to go to dealers and see if they wanted to help us, to have their name on the side of the car. HPP: Hedge's Pontiac was in Indianapolis. Why were they willing to support a South Carolina racer? CO: This came from Ray Nichels, who was in Highland, Indiana. Ray actually got this sponsorship set up for me. HPP: From 1960-1962, how many race cars did Hedge's Pontiac supply you with, and how were they outfitted? CO: In 1960, they sent me one. Then in 1961 and 1962, I had one No. 6 car and one No. 5 car. In 1960, we ran 389s and three-speed manuals. In 1961, we ran 389s and four speed manuals. In 1962, Hines Pontiac was my sponsor, and we ran 421s and four-speed manuals. HPP: Did Ray Nichels perform all of the race prep-work on your Pontiacs and then provide the turn-key race cars to you? CO: We took the stock vehicle and Ray did some engine work for us. He balanced the engines and that type of stuff for us. As far as the assembly work, I did all of that. HPP: Do you prefer to build your own motors, or to have them supplied to you? CO: I was building my own engines in the modified division so when I went to Grand National, I started building my own engines there, too. Mechanic Arthur Coker and driver/car owner Cotton Owens discuss their winning the pole for the 1960 Daytona 500. Behind both men is the car that did it-the No. 6 Pontiac Catalina. HPP: In 1960, who invented the trademark white-body-with-red-decals color combination on the Cotton Owens race cars? CO: That was my own combination. I like it because it shows up real good on the racetrack. If you've got a scorer in the stands, you've got to keep up with the number of laps that you're running. You want to be able to see it and spot it real quick so you won't miss it, and get you a lap behind. HPP: And how about the No. 6 on your race cars? What is its origin? CO: Well, that was a good friend of mine who had that No. 6 - Marshall Teague. When he went to USAC from NASCAR, it left the No. 6 open, and I took it from him. 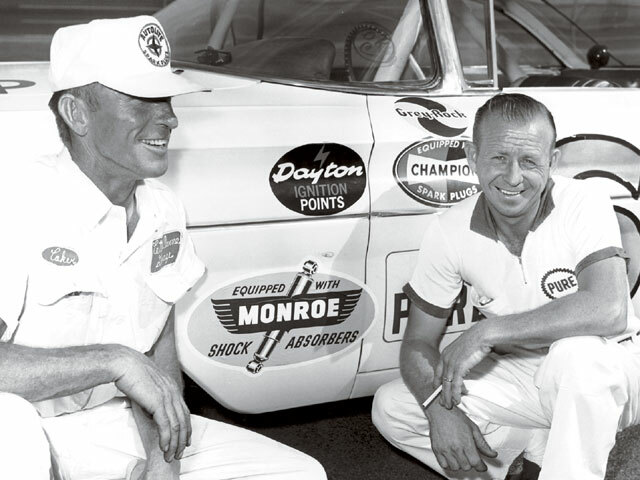 HPP: Did you ever feel any serious rivalry between you and the other Pontiac teams/builders such as Fireball Roberts/Smokey Yunick and Jack Smith/Bud Moore? CO: It was all very competitive. We took everything very seriously. Joe Weatherly, Cotton Owens, and Glenn "Fireball" Roberts smile in 1961 during the work for Ray Nichels Engineering and his endurance testing of the '62 Pontiac. This is the second of four '58 Pontiacs campaigned by Cotton Owens. Notice that it is a hardtop, and was not converted for the NASCAR convertible races that were popular that year. The Chieftain featured Pontiac's new 370 ci motor. W.H. Watson Trucking Co. was to remain Owens' sponsor until 1960. HPP: What was your favorite race of all time in a Pontiac? CO: I guess it had to be the [February 14,] 1960 race on live TV [CBS Sports Spectacular]. I sat on the pole at 149.892 mph. HPP: What was the toughest race for you ever in a Pontiac? HPP: What year Pontiac worked best for you? CO: I would say '60-'62 worked real well. The '57 Pontiac, though, I really loved to drive. HPP: What else do you want HPP readers to know about you and your Pontiac racing years? 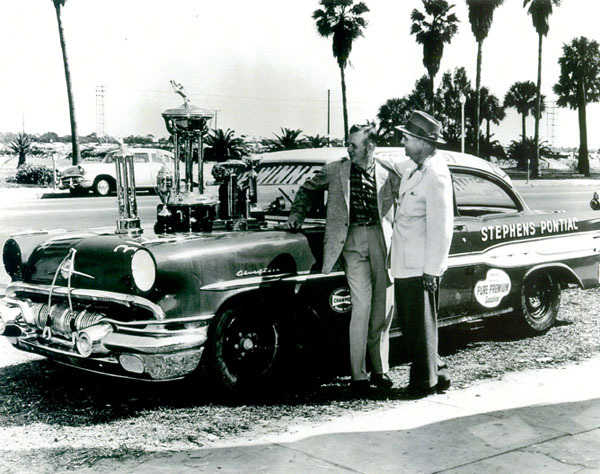 CO: Well, I have to tell you about a race against Fireball Roberts [the inaugural speedweeks race of the Daytona 500 in February 1959.] Fireball Roberts had a new '59 Pontiac. I didn't have one. So I went to my shop where I had four '58s that were wrecked. I took those four wrecked cars and put them all together into one race car. I showed up at Daytona a week later [than the other racers], and Fireball Roberts had the pole at 140 mph. I set a record by 3 mph faster than Fireball in my '58 Pontiac at 143.198 mph. HPP: How did the inaugural race of the Daytona 500 end up for you? CO: I ran fourth in the race with my '58. I had sold my '57 Pontiac to Charlie Griffin, and he ran third. HPP: Why did you stop driving Pontiacs in NASCAR? CO: I stopped driving [regularly] in 1962 because of double vision, and David Pearson started working for me. HPP: Who is your favorite Pontiac race car driver of all time? CO: I would have to say me. I enjoyed driving Pontiacs, and I've got to tell you, David Pearson is a great driver, too. He drives a lot like me. HPP: How do feel about your career with Pontiac from 1957-1962? CO: I was proud to be a Pontiac driver because I won the race for them [in 1957], and in 1961, and beyond, Pontiac took third place in [national] sales.